As the world's most popular GAMING graphics card vendor, MSI is proud to introduce its full line up of graphics cards based on NVIDIA's new Pascal GPU with fierce new looks and supreme performance to match. Building on the monumental success of MSI's award winning GTX 900 GAMING series, the MSI GeForce® GTX 1080 GAMING X 8G premieres the impressive TWIN FROZR VI thermal design allowing for higher core and memory clock speeds for increased performance in games. The famous shapes of the eye-catching TWIN FROZR cooler are intensified by a fiery red GAMING glow piercing through the cover, while the MSI GAMING dragon RGB LED on the side can be set to any of 16.8 million colors to match your mood or build. A completely new custom 10-phase PCB design using Military Class 4 components with an 8+ 6-pin power connectors enables higher overclocking performance to push your graphics card to the max. The classy matte black solid metal backplate gives the card more structural strength and provides a nice finishing touch. More links for "GeForce GTX 1080 Gaming X RGB 8192MB GDDR5X PCI-Express Graphics Card"
Categorically the best graphics card I've ever bought. It's a great overclocker, stable at 2180MHz on the core and 11300MHz on the memory, although I guess I just won the silicon lottery there. On water, with the voltage and power limits maxed it never gets hotter than 45 degrees, even in synthetics. Coil whine is audible under heavy loads, even at sub 100 FPS, but by no means to the point of being problematic. The large size of the card looks very impressive in your case too. 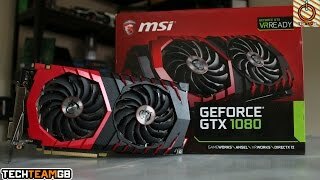 I'd wholeheartedly recommend this MSI card to anyone in the market for a GTX 1080. Purchased this to upgrade my msi 780ti because I have just purchased the HTC Vive from Overclockers as well. The card handles everything I throw at it in VR, super fast, very quiet, very pleased. Excellent service from Overlockers as usual. Best bang for buck for the 1080s? What a card. It's quite wide so make sure you're running a MIDI or full tower to ensure it fits. Using MSI Gaming App, the card appears to only run at half VRAM speed when running on Ultra in Fallout4. I suspect this shows there is a lot of life in the card. I moved from a Radeon 7970 to this beast and it's money well spent. Huge performance increase and very visible quality difference. And the noise levels.... what noise levels? Gaming will be a thing of beauty for some time to come! As for the delivery, excellent as always. Arrived exactly when DPD said it would. i bought this as i used to be abit of a gamer years ago but for last few years not had the time for my gaming time. bought built new rig with i7 skylake 6700k 32gb ram with ssd's but kept old 770 2gb card. was feeling like an old fart as i was playing like a nooblet. now i got the 1080gtx mainly playing rainbow six siege and getting 160-200fps now gone from nooblet to ownage and also being called a hacker again just like the good old days. makes me smile ha. cant wait to test this on battlefield 1. It definitely handles everything without issues. All games that I throw at it, are 60+ FPS at maximum settings at 2560p resolution. Also very quiet, so that is awesome! "Somewhat unsurprisingly, the GTX 1080 Gaming X 8G is a highly desirable card. It's built with the world's fastest gaming GPU at its heart, and you get both a core and memory overclock to boot as well as a fantastic cooler with very low noise operation, cool temperatures and the ability to switch off when idle. The RGB LEDs add a bit of extra pizazz, and the backplate is another welcome addition. There's even a bit of extra headroom for further overclocking"
"The MSI GTX 1080 Gaming X 8G RGB is the Cameron Diaz of graphics cards – its a beauty. MSI continue to make the best looking graphics cards on the market. The Gaming X combines top drawer performance with effective cooling proficiency and the ability to hit 2ghz+ in MSI Afterburner without much effort."